David Wring’s wife Sarah had a series of heart attacks 15 months ago, caused by SCAD. 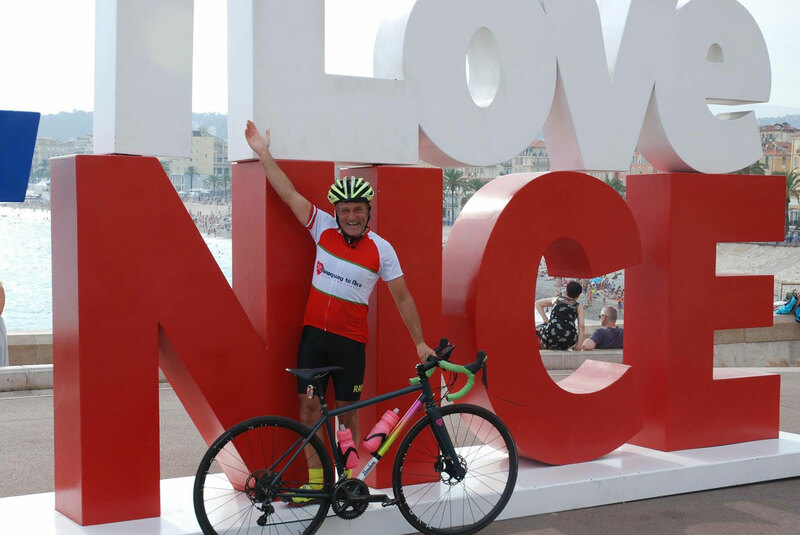 They are both committed to raising awareness and funds for Beat SCAD and the SCAD research project in Leicester, so David set himself a massive challenge of cycling from their home in Devon to Nice – more than 1,100 miles. “My obvious motivation was Sarah’s completely unexpected SCAD episodes, but additionally the unique care from Glenfield Hospital and Dr Abi Al-Hussaini,” said David. Sarah has never smoked, taken drugs, doesn’t drink and took regular exercise so had no risk factors for normal heart disease. 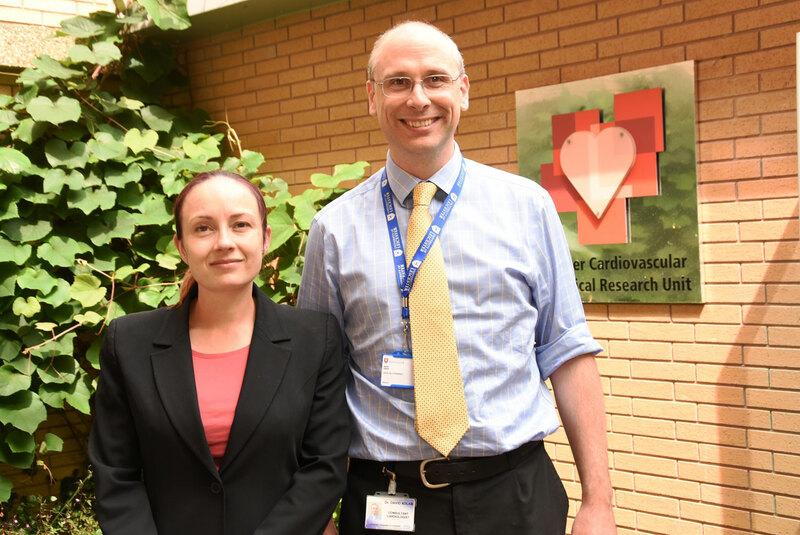 “Sarah was incredible lucky to be correctly diagnosed at Truro Treliske Coronary unit by a cardiologist Dr Audrius Simaitis, who had recently attended a cardiology seminar in New York and, fortunately, a discussion group about SCAD. But this element of luck needs to be reduced,” said David. 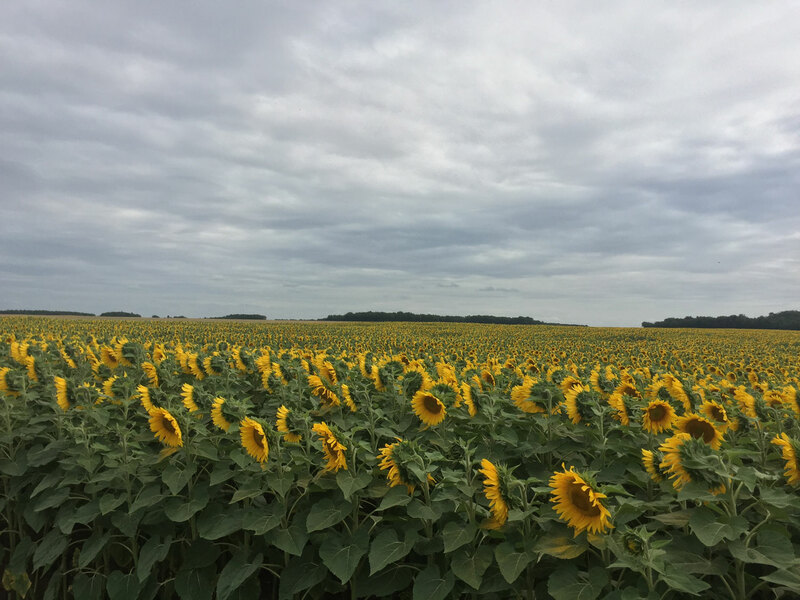 David’s route started on 6 July at Plymouth docks Roscoff, went to St Malo, St Quentin Sur La Homme, Vitré, Angers, Richelieu, St Savin, Bonnat, Peyrat le Chateau, Riom, St Flour, Mende, Pont d’arc, Ballon, Vaison la Romaine, Sault, Greoux, Castellane and finally arriving after 18 days in Nice on 24 July. 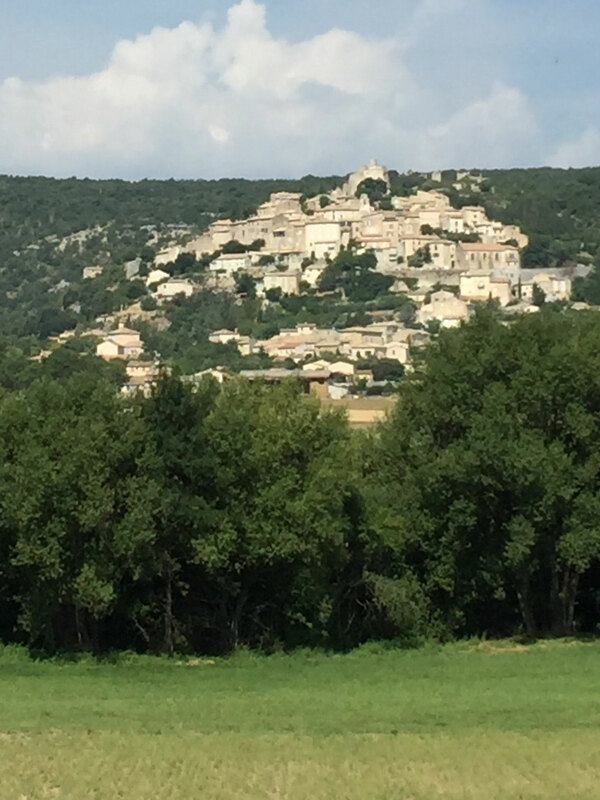 And making the challenge even harder was the temperature, which reached 39 degrees through Provence. “I designed a cycle jersey and had it made up. The design incorporates the heart and the bike – my new bike, Aldo, also has the logo on it.” The bike is a hand-built Donhou and the logo is hand sprayed into the finish. 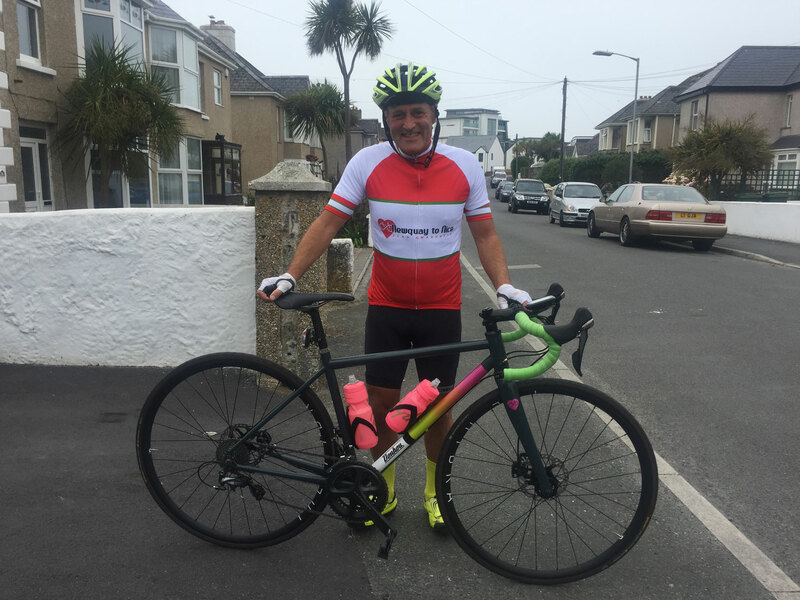 He described the first part of the route: “I rode from my home in Newquay to Plymouth docks to Roscoff, then rode to Morlaix then Renn then St Malo, where I joined my support team Green Jersey French tours. 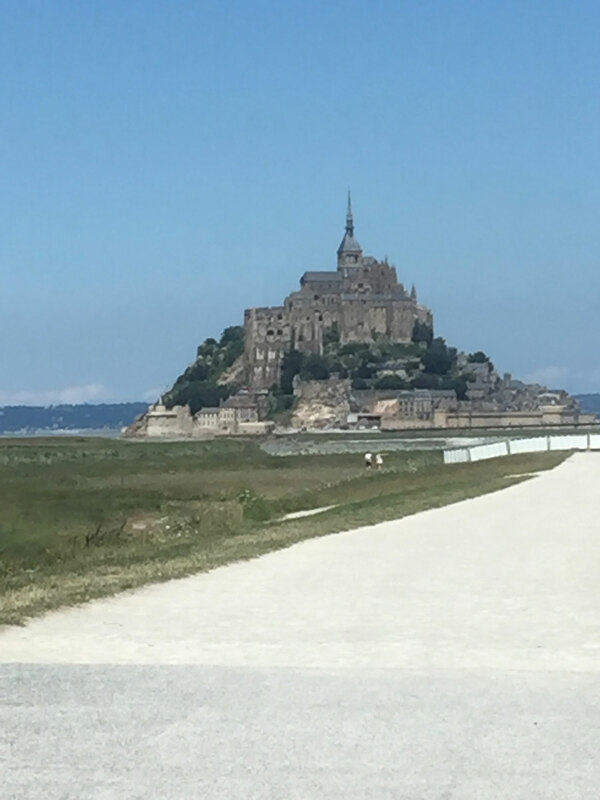 We then cycled to St Michel – approx 80 miles per day. On his designated day off he met two rugby players, who offered him £200 to ride up Mont Ventoux. He was also challenged to wear a tricolor club jersey (see photo). He accepted both challenges. 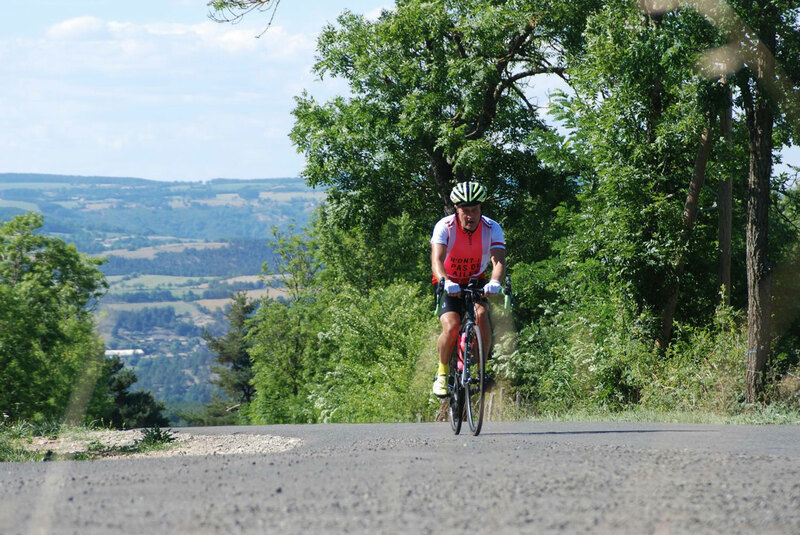 “The climb is a renowned killer with a 9% hill for 22km. 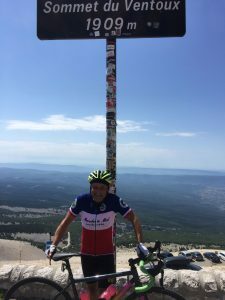 It took me 2 hours 15 minutes to ride up that hideous climb, but it was worth £200 for the cause,” he said. 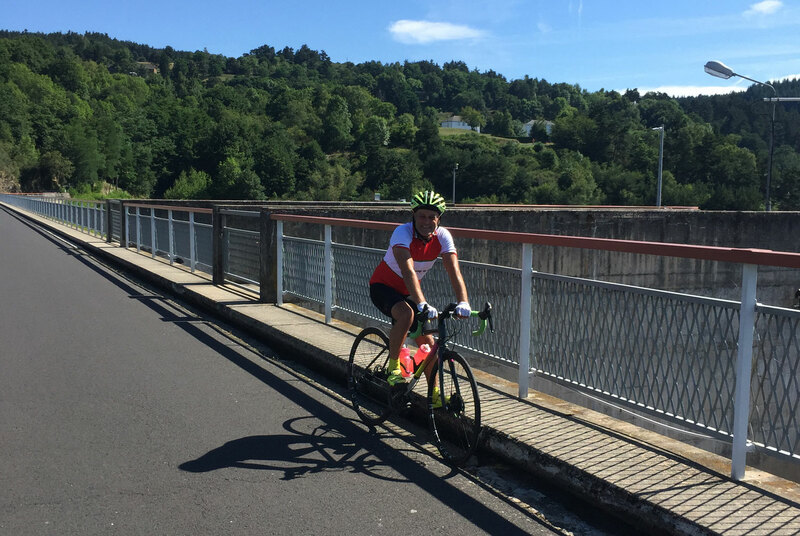 Towards the end of the challenge, he cycled from Gorges de L’Ardeche to Vaison la Romaine. 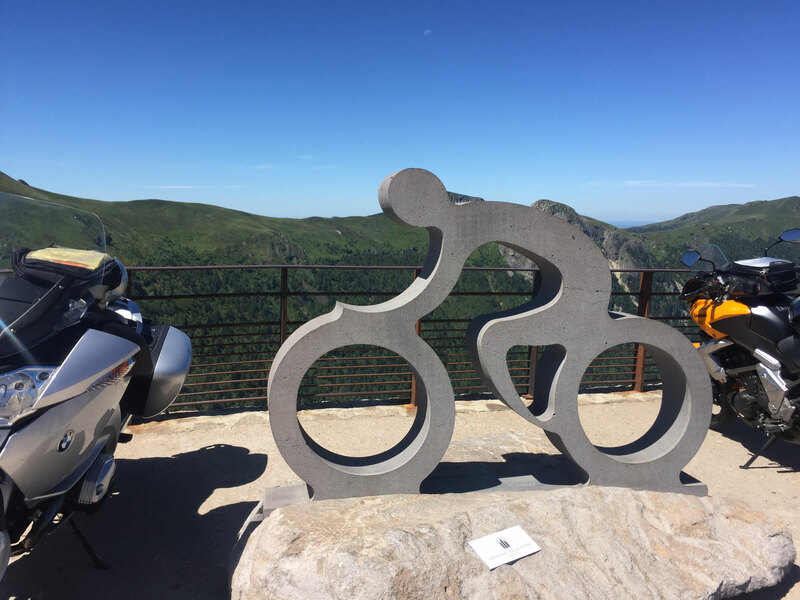 “After the climb out of the gorge, the most stunning road opened up and the ride along the top of the gorge was simply the most spectacular I have ever ridden. 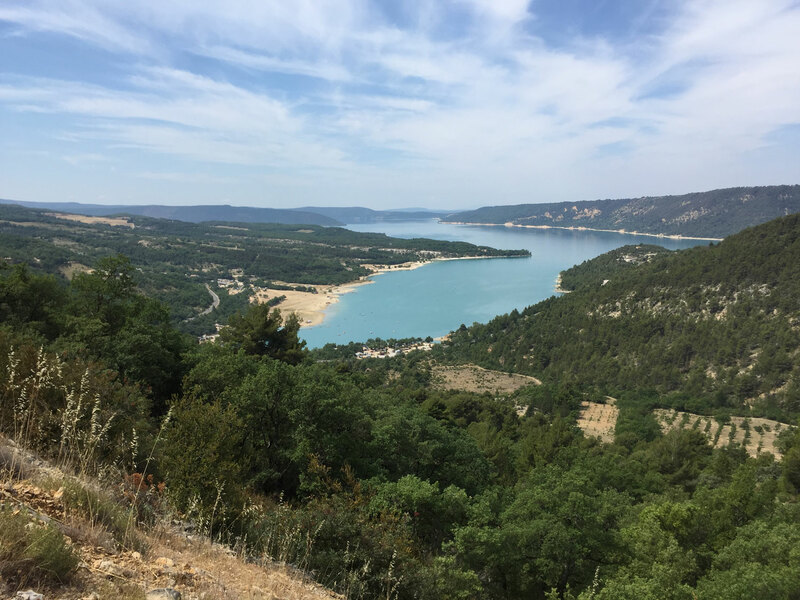 After the gorge, we then crossed the Rhone and into Provence following the mighty Mont Ventoux with its white stone cap. The heat was intense – at 39ft my water bottles were really warm, which made hydration tough and no businesses were open and the roads and streets deserted. “The journey became painfully slow but eventually we made the hotel and, with 2 litres of cold water drunk, the dizziness passed. I’ve never known a taste so sweet as that cold water and it will be one of my top memories. 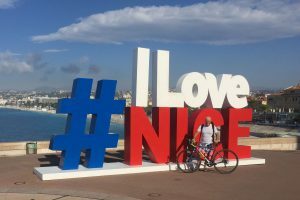 David completed his cycle in the beautiful city of Nice on 24 July – saddle sore, aching but celebrating his fantastic achievement. The generosity of the people he met and those who have donated via his Just Giving page has been fantastic, but one man stuck in David’s mind. He has so far raised £2,327 and is hoping to reach a grand total of £2,500. The Just Giving page is still open, so click hear to donate to help further research into SCAD. Well done and a massive thank you to David (and his support team) for completing this mammoth challenge. We hope your aching muscles recover soon! See below for a slideshow of more photos from David’s trip. 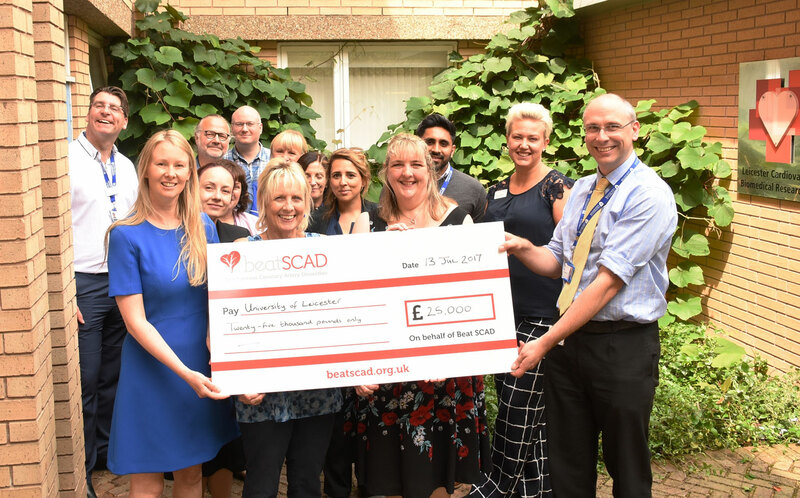 Thursday 13th July 2017 was a landmark day for Beat SCAD following the presentation of a £25,000 donation to the SCAD research project in Leicester. Thanks to the hard work and generosity of the SCAD community, Beat SCAD Trustees Rebecca Breslin, Karen Rockell and Debbie Oliver (pictured above) were overjoyed and immensely proud to hand over the sum that will be used towards the salary of the new Clinical Research Fellow, Dr Alice Wood (pictured below left, with Dr David Adlam, who is leading the UK SCAD research project). Dr Wood is a UCL graduate who joins the Leicester team to replace Dr Abtehale (Abi) Al-Hussaini who is returning to London to a consultant position. Dr Abi will remain involved in the SCAD research programme, as well being available to treat SCAD patients during her weekly specialist clinic. Since the launch of Beat SCAD in 2015, SCAD survivors, family members, friends and work colleagues have been incredibly busy completing an array of individual and team challenges as well as organising and participating in Beat SCAD events including ‘Scones for SCAD’ bake sales and walks to help raise this fantastic amount for the research programme. Please take a moment to catch up on highlights of Beat SCAD’s first year by watching our achievements video and reading the annual report. Beat SCAD Trustee Chair Rebecca Breslin said: “This is our first Beat SCAD donation to the research and we are so happy to present this on behalf of our patient group and supporters. It is exciting to see the money raised being put into action to further the research. After the presentation, the Trustees met with Dr Adlam, Dr Abi, Dr Wood and Cardiac Research Nurse Ellie Clarke and discussed the research status in the UK, Europe and Worldwide plus plans for next steps with the programme, including additional research team members: scientist Anna Baranowska and NHS-funded academic Dr Marios Magaritis. Thank you to everyone who has supported us in any way to further the Beat SCAD mission – whether by helping to spread the word about SCAD, being a part of the support network to help others affected by SCAD, volunteering, donating, organising or participating in events. This donation is a result of your hard work and dedication to this cause. Thanks also to the SCAD Research team at the NIHR Leicester Biomedical Research Centre (formerly Leicester Cardiovascular Biomedical Research Unit) for their continued dedication and support. Click here for more information about the SCAD research.